Well, the first of my cancer checks is in and it’s clean! This past week I had an ultrasound/biopsy looked at for a ‘funny looking’ lymph node under my arm and it was clean! One step closer to a clean bill of health for another 6 months! Next up, blood work and possible ultrasound for my neck…the original sight of my cancer…sigh, one day at a time. This was also a big week for my kids. My oldest got his first job!! I am so proud and happy for him. He worked hard to become a Red Cross certified lifeguard over the summer and just got a lifeguarding job locally. Considering it was his first actual job interview, he was nervous and was asking what kind of questions they may ask, but he did it! I have a working child! After practicing all summer long for a sport she never played, Audrey made the volleyball team. Again, another proud moment. She is my strong-willed and determined child and once she sets her mind on something she goes for it. She knew she wanted to be on the team so she literally carried a volleyball around the house all summer and practiced non-stop. Well, last week, out of the 40+ that tried out, she made it on the team! Let’s see, what was Alex’s big moment? He started as the quarterback for his flag football team, but was cut short because a player grabbed his thumb instead of the ball and…well, he tore his ligament. Fortunately, it was his left hand and not his throwing hand, so after a week of ‘healing’, he was playing again yesterday, splint on one hand but throwing a touchdown pass with the other. They’re all so different and special. Life continues to move forward no matter how much I want it to stand still at times. Recently a friend asked when exactly a cancer patient feels somewhat free of cancer, that moment when you start forgetting. I thought about it, and I think it’s never. It’s been almost three years for me (not without some scares in between of course), and it’s still on my mind. It may not be as prevalent as it used to be, but every time I get a sore throat, a cough, a weird ache or pain, I wonder. Every check up, ultrasound, PET scan, bloodwork, I still hold my breath; and then there’s the scar I see everytime I look in the mirror. It’s not bad, I just see all those things as reminders of not only what I’ve been through, but also helps me focus on how I want my life to be. Life is fleeting…Somebody should tell us, right at the start of our lives, that we are dying. Then we might live life to the limit, every minute of every day. Do it! I say…, do it now! There are only so many tomorrows.~Pope Paul VI We are not invincible, we are all dying. Because of that situation happening personally, I am struggling to find joy and peace. I know they’re there but sometimes relationships or circumstances continue to grate at you and steal it away. 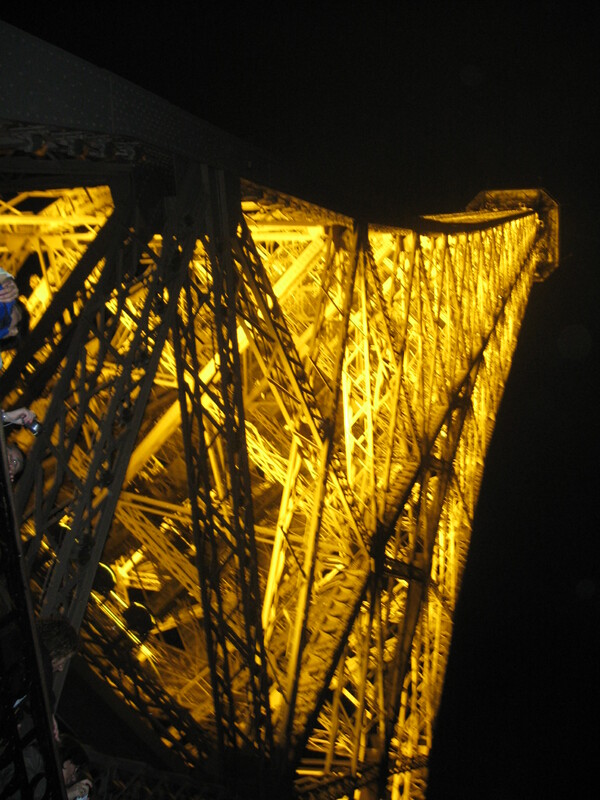 Looking at my picture of the Eiffel Tower above, I know that looking up from the bottom is overwhelming, but getting to the top is always achievable. Again, life is short, so I will continue to grab at the small bits of joy, peace, and hope for a better tomorrow, however brief those moments may be until I can breathe again. I continue looking up. Thank you all for your support and for continuing to follow my lipstick journey! 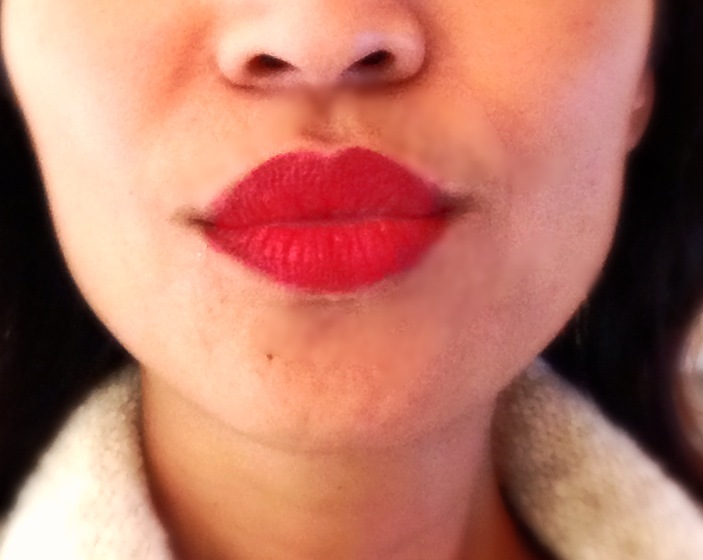 Today I wear Rimmel Kate Lasting Finish Lipstick in #111, Kiss Of Life. These lipsticks are matte but not too drying so I don’t mind them with a little bit of lip balm (on this I would use Philosophy, Kiss Me), or gloss. This color is RED and I mean classic, bright, blue red (at least on me). Remember what I said last week about my lips not entering the room before me? Well, when I wear this, I think my lips would be in the room the day before I got there. Sometimes a gal just needs a good red and you gotta love the name, Kiss of Life! Cheers!